Vehicles churn out about 28 percent of the carbon dioxide (CO2) generated from fossil fuels in the United States, and their contribution keeps climbing, particularly in urban areas. But planners and policymakers have lacked a good handle on just how much CO2 is produced by vehicle travel in cities and suburbs, which is key knowledge for urban or statewide greenhouse gas control efforts. Now, Boston University (BU) researchers have created DARTE (Database of Road Transportation Emissions), a new nationwide data inventory that can help to provide this crucial information. Constructed from the Federal Highway Administration’s Highway Performance Monitoring System database of roadway traffic, DARTE brings together 33 years of data for CO2 emissions from roads across the entire country on a very tight scale—only one kilometer wide. 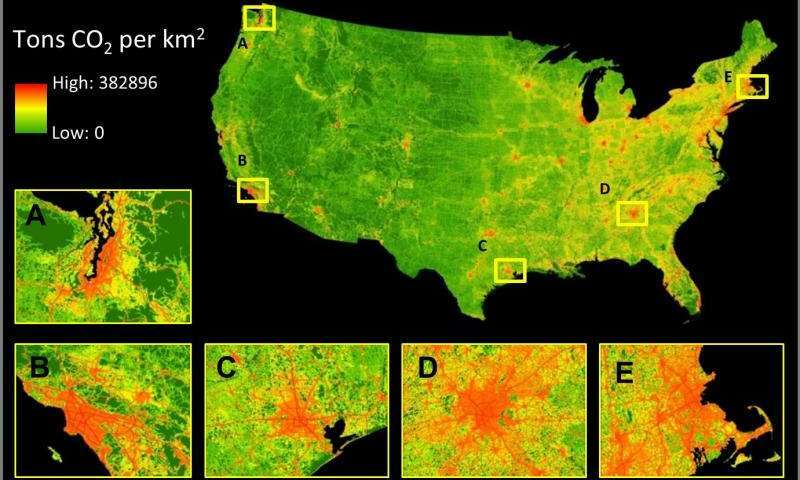 Early findings in DARTE highlight the ongoing shift in the U.S. towards urban traffic and emissions. “DARTE reveals that urban areas were responsible for 80 percent of the growth in vehicle CO2 emissions since 1980, and for 63 percent of total 2012 vehicle CO2 emissions,” says Conor Gately, a graduate student in BU’s Department of Earth and Environment, and lead author on a paper published today in the journal PNAS.